At the heart of every quality pool installation is an energy-efficient climate control system. Now members of the pool trade can boost their knowledge and expertise in this vital area by attending free Training Seminars from the market leader – Heatstar. 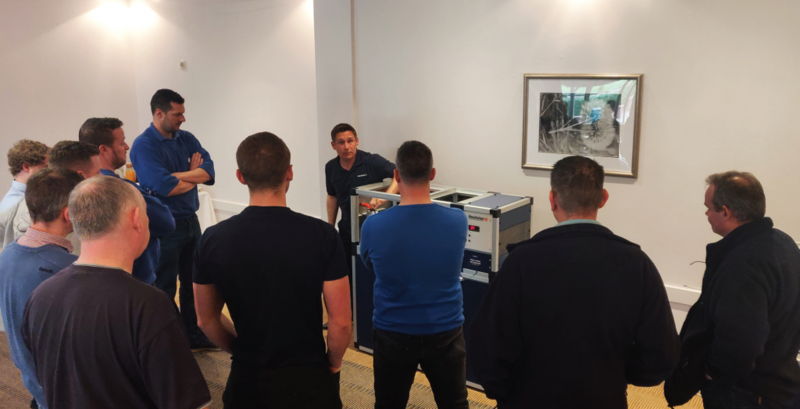 Heatstar’s 2019 programme of free training seminars, held at venues around the UK and at Astralpool’s head office in Fareham, started during March in Leeds. A total of 26 delegates booked to attend one of the three half-day seminars held during that week. The seminars were hosted by David Hayles, Technical Manager of Heatstar and organised and assisted by Ron O’Sullivan of Astral UK. Each seminar runs for half a day – typically around five hours. These free seminars include practical tuition, training materials, lunch and a Training Seminar Attendance Certificate. The purpose of the seminars is to assist engineers of the swimming pool trade in gaining the knowledge required to carry out the installation and maintenance of Heatstar systems. The seminar is also designed to develop both technical knowledge and practical application, along with a full and in-depth explanation of the technology behind the Heatstar equipment and to give a better understanding of the fundamentals of swimming pool heating and ventilation. For the first time at these seminars Heatstar also introduced some additional training on the LYNX remote controller as this is now a common feature to be found on Heatstar systems in plant rooms around the country. The second set of seminars took place at Astralpool’s head office in Fareham later in March. Over the period of three half day seminars during the week over 30 delegates booked to attend. Since these free seminars started, Heatstar have seen around 250 people, to the end of 2018, gain certification through attendance with that number scheduled to comfortably exceed 300 during 2019. The technology relating to heating and ventilation of swimming pools is fast moving, highly legislated and environmentally challenging – accelerating the demand for highly skilled engineers. By participating in dedicated training members of the pool trade will develop the specialist knowledge and practical skills that will enable them to install and maintain Heatstar systems, advance their industry qualifications and improve the efficiency of their customer’s system. “Heatstar’s Training Seminar was well presented – not too complex by any stretch and covered off everything we wanted to gain from it,” summed up Nick Bettin of Alan Bettin Pools. “We found it very useful and also the presentation and fault-finding literature was very well put together. We look forward to the next one!” Contact the team for full information on Heatstar’s free seminars during 2019.